These dentures are made to replace all of the teeth in an upper or lower jaw, or both. They are custom made for patients who have lost all or most of their teeth. The dentures improve a patients’ ability to eat, speak, taste, and smile. A denture can help facial muscle tone and if a denture is made properly with care taken to choose the size, shape, length and colour of the teeth many patients feel that a very youthful appearance can be restored. Our dentists in Catford at the Hillview Dental Centre commonly recommend a specific type of denture called an “Immediate” denture. Immediate dentures are very popular because it gives us the ability to restore the missing teeth the same day as the remaining teeth are removed without the embarrassment of being seen with no teeth. Partial Dentures are different from Complete Dentures because they are not made to replace all of the teeth, but instead only replace a few teeth in the jaw. They are custom made removable teeth that offer immediate partial teeth replacement by attaching or clasping to natural teeth for retention but are removed (for cleaning and sleeping). 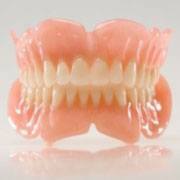 Flexible partial dentures are the comfortable, beautiful, and affordable choice. It was long thought that removable partial dentures had to be rigid to be effective. The innovation of the flexible denture allows the restoration to adapt to the constant movement and flexibility in your mouth. This is the underlying thinking behind innovative flexible, removable partial denture. The flexibility, combined with strength and light weight, provides total comfort and great looks! The preparation is relatively simple because your natural teeth don’t need to be altered in any way. The partial is virtually invisible because there are no telltale metal clasps and the material itself blends with the tissue in your mouth so that the only thing that shows is your beautiful smile. When considering a removable partial, many people find the Flexible Partial to be the most comfortable option, and the final restoration can be made very quickly! While the cost is often higher than a partial made with visible metal clasps, the results of the flexible partial are beautiful, and patient satisfaction is very high. The flexible partial involves only non-invasive procedures, and gives you confidence in your restoration while talking, eating, and most importantly: smiling! How long will it take to get my partial dentures? Sometimes a partial can be delivered in as little as two visits, but usually the average is four visits. 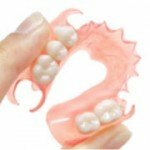 Partial dentures fabricated from flexible are non- invasive so there is minimal discomfort. Sometimes preparations to the abutment teeth are necessary, but there is little discomfort associated with the procedure. How long will my Sunflex® Partial last? Flexible Partial Dentures are designed to last a lifetime. Should modifications be needed as time goes by, due to natural changes in your mouth, your flexible Partial can be modified rather than replaced. Some designs of partial dentures may not be recommended for overnight use. Ask your dentist. Do I have to put my denture in water when I am not wearing it? In order to keep your flexible Partial looking and feeling like new, we recommend (when you are not wearing it) that you keep it immersed in water or denture cleaner. Will I have difficulty chewing? Some foods may never be easy to chew with dentures, but a properly designed and fitted partial, combined with flexible Partial’s durability and superior adaptation will give you the best chewing experience of any denture material available. Sometimes it is difficult to speak clearly with missing teeth; therefore, the partial may improve your speech clarity. If you find it difficult to pronounce certain words, do not worry. Over time you will become accustomed to speaking properly with your Sunflex® Partial denture. Can I make minor adjustments to my partial denture? We strongly recommend that you do not alter your partial in any way. If adjustments need to be made, please see your dentist.